Techniques and tools to learn more efficiently and effectively. Set goals. Are you looking to gain a new skill, get a certain grade, advance to a particular position? If you can articulate what you want, it can make it easier to plot a path. Identify priorities. Find out which tasks are the most important, the most urgent, or a combination of the two. Create a plan. A weekly plan for your tasks will help you to see how they'll fit into your life, and help you to maintain work/life balance. Avoid time-wasting and procrastination. Time-wasters could be activities, habits or even people! It can be helpful to go to a setting where you are less tempted to procrastinate, such as the library. See the tabs below for more information and resources on these steps. In order for you to succeed, your goals have to be well-defined. The SMART acronym provides a way for you to think more deeply about your goals. Specific. Define the "who, what, where and why" of your goal, including resources at your disposal and any restrictions that exist. Measureable. What are the ways you might measure your success? Define the "how much" or "how many" aspects of your goal. Achievable. While it's important to set your sights high, you need to be realistic. Addressing the other SMART criteria will help to indicate if the goal is really achievable. Relevant. Sometimes we hold onto old goals without re-evaluating them. Is this is goal something you still want (or did someone else want it for you)? Is this a good time in your life to pursue this goal? 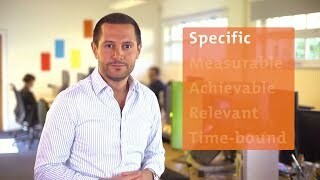 This video provides an overview of the SMART goals principles. Download this Word document to apply the SMART criteria to your own goals (Project Smart). It can be tough to juggle tasks from our homes, school, work, and personal relationships. The key is to prioritise your tasks. Quadrant 1: Important and urgent. There are some things that you have no choice but to attend to - such as family responsibilities, important calls or texts. This is the "crisis" or "necessity" quadrant. Quadrant 2: Important and not urgent. These things are important, but you have a reasonable amount of time to achieve them. This is the "personal leadership" quadrant, where you write down your goals. Quadrant 3: Not important and urgent. This is where getting distracted by texts or interruptions can start to interfere with your goals. This is the "deception" quadrant. Quadrant 4: Not important and not urgent. This is the "waste" quadrant. While there's nothing wrong with taking a break to look at social media or watch an episode, procrastination can start to set in you spend too much time in this quadrant (Dillon, 2018). How does this matrix apply to your life? Download the template below and see where your tasks fit in. 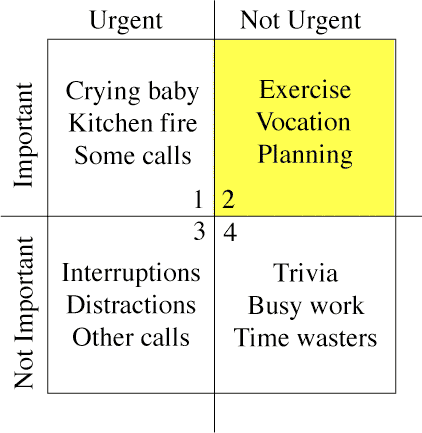 Define your priorities using this time management matrix template (Toolshero). Add all important deadlines (registration, submission, exams) and work backwards from them to determine when to start working. Add holidays and study breaks. Do important work and academic work when you are at your most productive. Are you a morning person or a night owl? Schedule 1 to 2 hours of independent study time for every hour of scheduled class time. University/study commitments must take priority but also make time for family, friends, and yourself, to maintain balance. Are you a procrastinator? If these scenarios sound familiar to you, then you just might struggle with putting things off. My paper is due in two days and I haven’t really started writing it yet. I’ve had to work all night to get an assignment done on time. I’ve turned in an assignment late or asked for an extension when I really didn’t have a good excuse not to get it done on time. I’ve worked right up to the minute an assignment was due. I’ve underestimated how long a reading assignment would take and didn’t finish it in time for class. I’ve relied on low-quality information because I didn’t finish the reading on time. 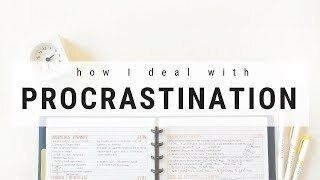 Some of the information on this page will help you overcome procrastination. For more tips and tricks, see the resources below. Simple tips presented by a university student, showing methods that have worked for her. Procrastination is often applied to the writing process. This guide identifies the root causes of procrastination in writing and provides practical guidance on how to address them (University of North Carolina). These tools are designed to help you stay on track, which will make your time at University less stressful. Give them a try! Put in your assignment's due date, and this tool, will tell you what you need to do, and when you need to do it. Set tasks, due dates and reminders to keep yourself on track. 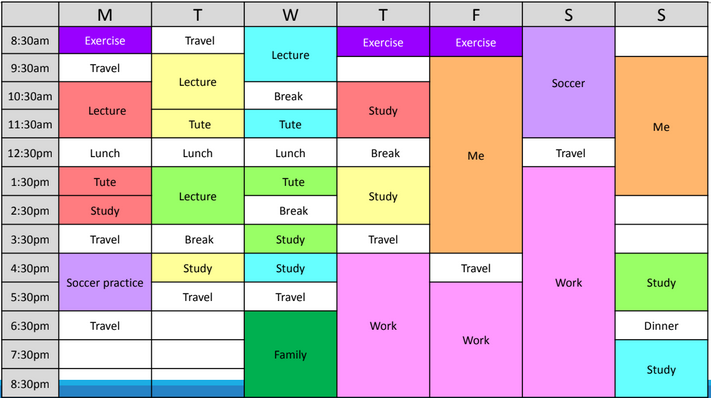 This resource was designed by high school students to fight procrastination, and is based around assignment due dates. This tool (Chrome extension) will restrict or block your access to websites you designate as time-wasters. Learn how to use the tools in Microsoft Outlook to get your inbox organised. Covey, R., Merrill, A. R., & Merill, R. R. (1994). First things first. New York, NY: Free Press.